If you’re a technician or technical manager working on a large-scale web site reading this book is not an option. This is a must-read book. However,if you don’t work in such environment, don’t bother reading the book! It will be very hard to related and understand. 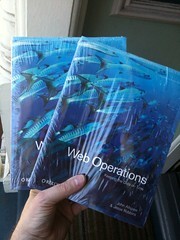 The book is composed of 17 chapters collected from interviews with and white papers written by web operation veterans. I found it very interesting and very beneficial. All chapters are written by experienced people and reflect a real deep knowledge and solid experience in the different web operations aspects. One thing I found a bit misleading in the book title, specifically the “Keep Data on Time”. I believe it doesn’t really reflect the content of the book. finally, Aside from the simple language and richness in real life examples, I liked the fact that a lot of the management practices mentioned in the book all have a counterpart in ITIL, which I am in love with.